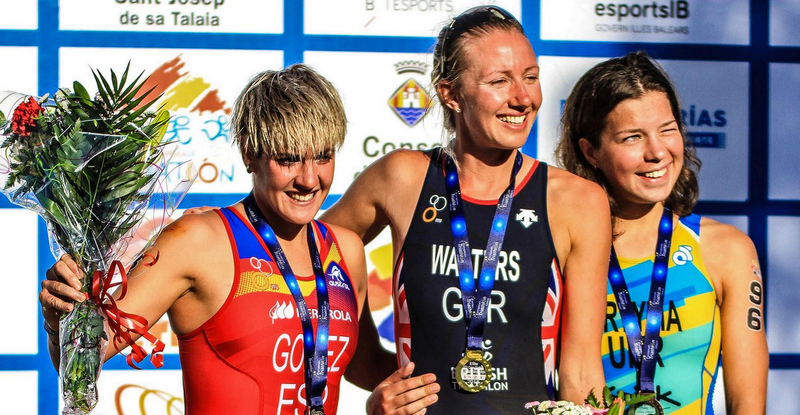 We saw strong performances from the U23 athletes when they had the chance to race against the Elite in the Cross-Duathlon and once again, in the women’s race, it was to be that a younger athlete would push the elite all the way to the line. Victory went ultimately to Great Britain’s Nicole Walters the runner-up in Fyn. 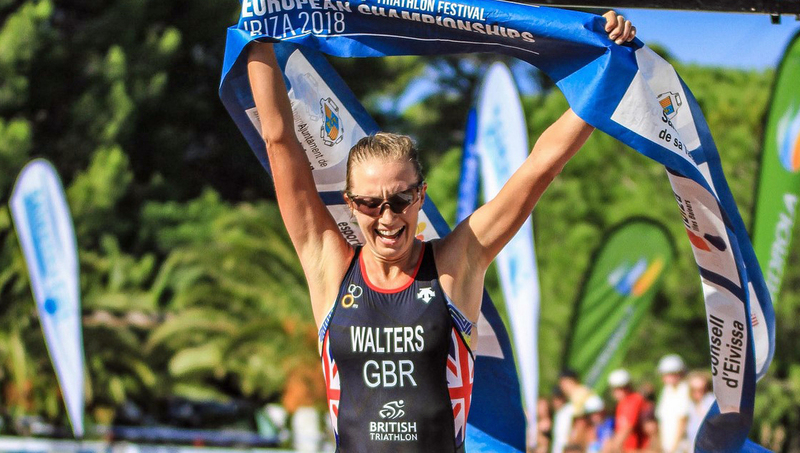 Walters is well-known on the Xterra circuit and was guide to PTVI athlete Melissa Reid in Rio, making it to the podium and collecting the Paralympic bronze medal. With her swim power now able to work to her advantage, she was no doubt confident that her 6th place in the Cross-Duathlon would be improved upon. A breakaway of four athletes; two elite, two U23, was led by Ukraine’s Sofiya Pryyma and Antoanela Manac ROU, who first got a taste of off-road racing last year on home soil in Târgu Mureș. The two U23 athletes were followed by Laura Gómez Ramón and Walters. With Manac usually racing the “on-road” circuit and with limited time to train off-road, she was soon dropped and Walters, applying the pressure, simply pulled away with only Gómez able to keep her in sight. For Pryyma, she has once again shown her power. Coming to the race after the oven-like temperatures in Eilat only the weekend before, her determined attack at the start, and solid bike leg, was finished with an impressive final run to take her onto the podium, claiming bronze but also winning the U23 title ahead of Manac and Russia’s Daria Rogozina. 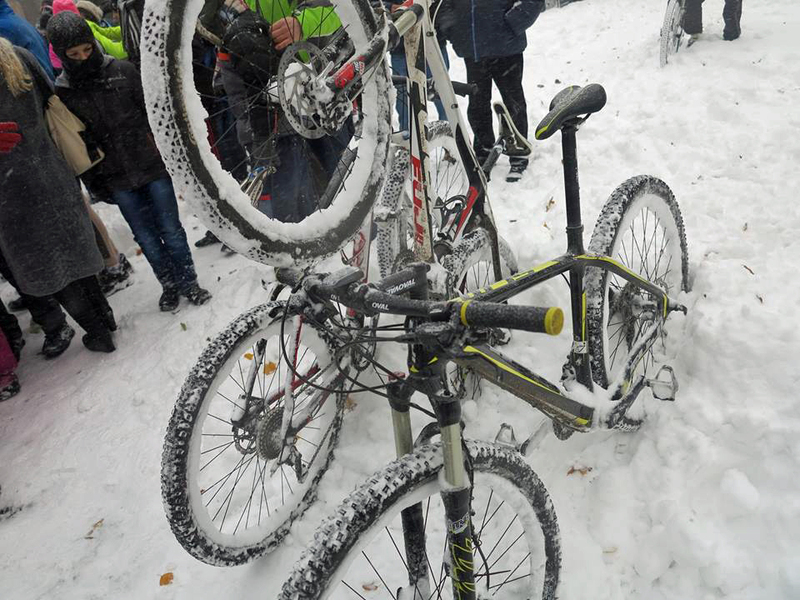 With the blinding sunshine of Eilat and the rain-swept, then sun-drenched courses in Ibiza a fond memory, Pryyma is now training in the winter wonderland of Ukraine in preparation for 2019. The men’s race was in some ways a copy of the women’s with U23 athletes featuring in the top-end racing. Coming to the start line with the Cross-Duathlon title already claimed, Belgium’s Tim Van Hemel was up against some of the best off-road specialists in the world. Against all odds, he was able to “do the double” with once again absolutely breath–taking riding off road. He came out of the water some considerable way down the pack and with Brice Daubord almost 30 seconds ahead, there must have been some small concerns at the back of his mind. Overtaking the Frenchman out on the bike course was just the signal that Van Hemel needed and coming into T2 with over 30 seconds in the bag, his final run was enough to secure both off-road titles. Daubord’s blisteringly fast final run was simply not enough to catch his northern neighbour but was enough to keep him ahead of the young pretender from Italy, the world U23 champion, Marcello Ugazio whose bronze medal and victory in the U23 category has clearly signalled to everyone that he has great potential. In the U23 category, it was a glory day for Italy, with Tommaso Gatti winning silver ahead of the swim leader, Kevin Tarek Viñuela González. Amongst the Juniors, we were treated once again to a running masterclass by Italy’s Marta Menditto. Having lost out in Târgu Mureș last year, where she comfortably won the Cross-Duathlon but lost out in the Cross-Triathlon against the stronger swimming of Pryyma, she has clearly been working on her swimming and with two world junior bronze medals, she could come to Ibiza knowing that the balance would be in her favour. Having won silver in the Cross-Duathlon only a couple of days earlier, she knew that her bike to run would be good. Losing only a few seconds in the swim, she was soon able to catch up and, with her explosive final run power, the title was pretty much hers as she entered T2. 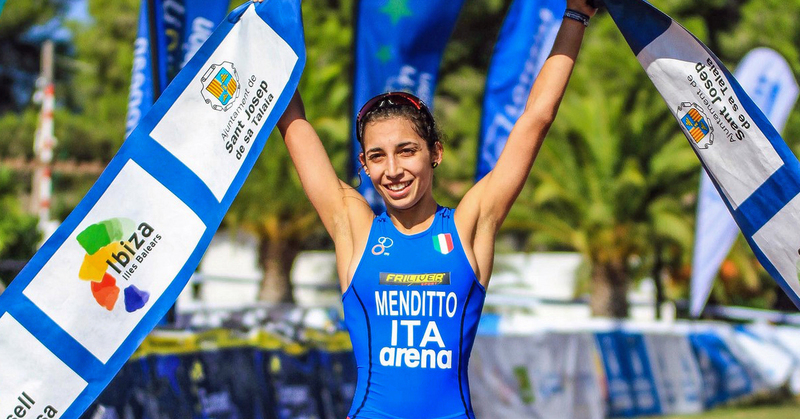 Reigning world champion, Pavlína Vargová CZE was the main threat in her final year as a junior but it was out on the run course that Menditto took command. A silver to the Czech athlete ahead of the swim leader, Lýdia Drahovská. 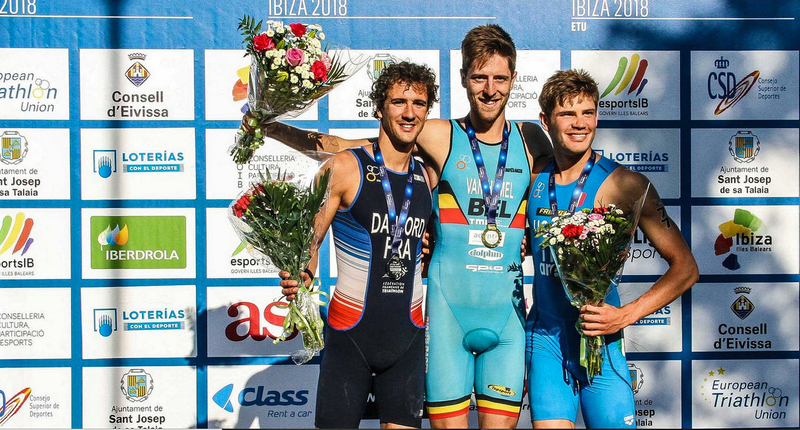 For the Junior Men, the anticipation was that Spanish athlete, Nicolás Puertas Fernández could claim both titles after his convincing victory in the cross-duathlon. The swim was dominated by Croatia’s Luka Grgorinić but the rocky terrain soon slowed him down and he could do nothing to prevent the off-road powerhouse riders from taking the advantage. With Italy’s Filippo Pradella edging ahead on the bike, it was down to the run power of Puertas to seal the victory. He did just that with a stunning 14:15 to close the race down. Pradella came home for silver but it was a nail-biting final few metres that decided bronze. Spain’s Alfonso Izquierdo, making his international debut, as almost caught out by fast-finishing Petr Velíšek. His silver in the Cross-Duathlon had shown us his pace but it was just not quite enough to catch the Spaniard and he lost out on a podium place by just one, small second. 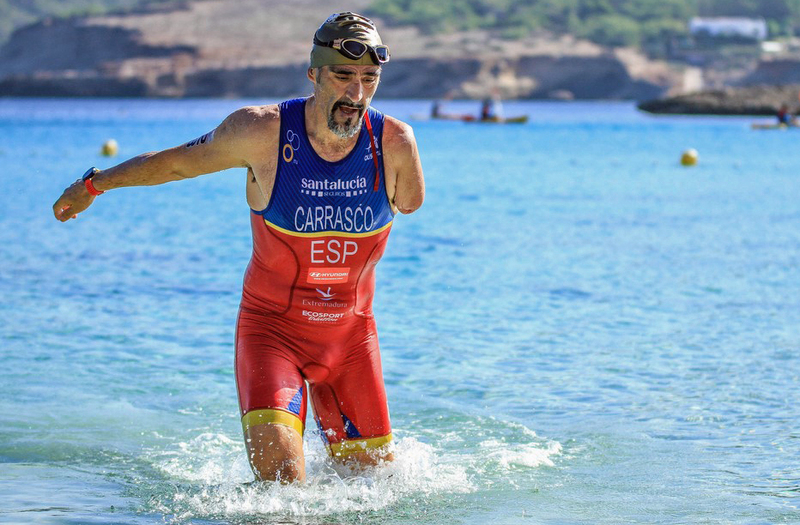 Three categories were represented in the Para-Tri Championships. The medals were shared between Spain and Italy, with the host nation taking the lion’s share. 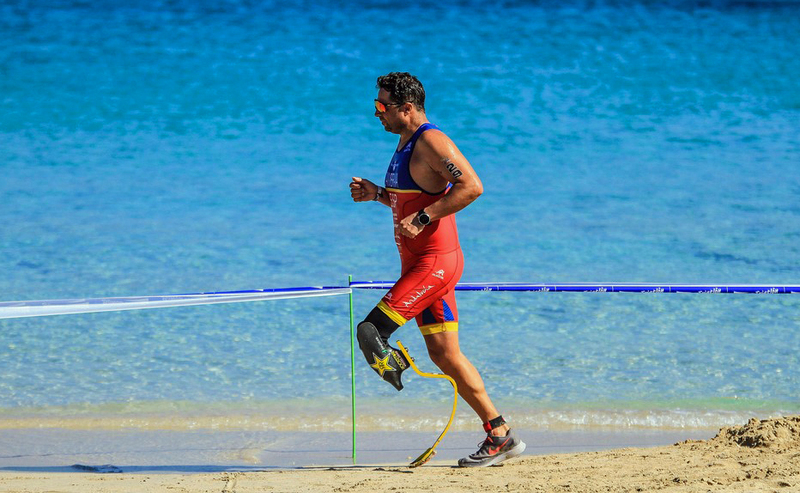 When you look at the degree of difficulty out on the bike and run courses; a mixture of rocks and sand, the performances really are put into perspective. 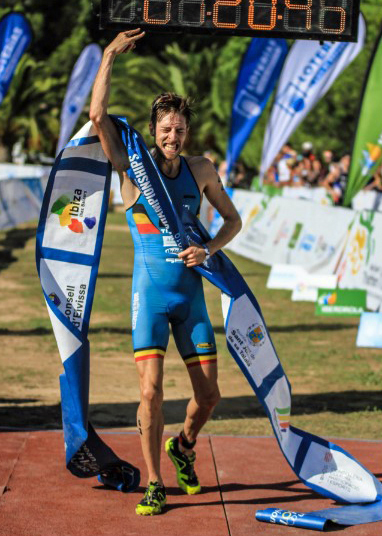 In the PTS2 Category, it was gold to Ricardo Marín Arcis to add to his title collection on the island. 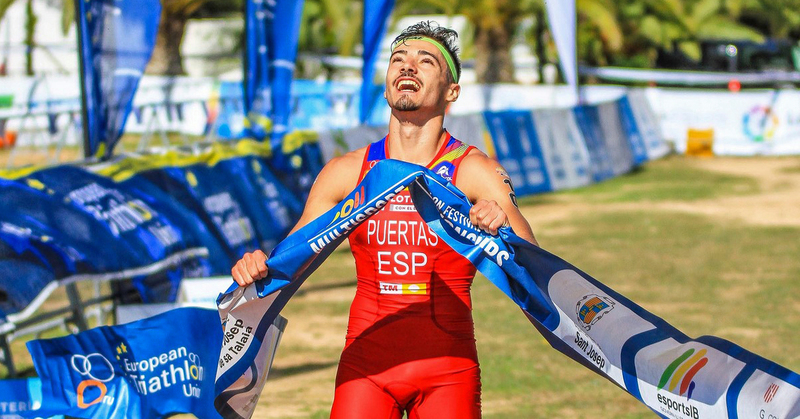 PTS3 saw gold and silver going to Spain, with Raúl Zambrana Romero having greater control over the bike than runner-up Kini Carrasco who within days of the race was under the surgeon’s knife to sort out an Achilles problem. The PTS4 category saw a full podium, with once again the host nation taking the title. 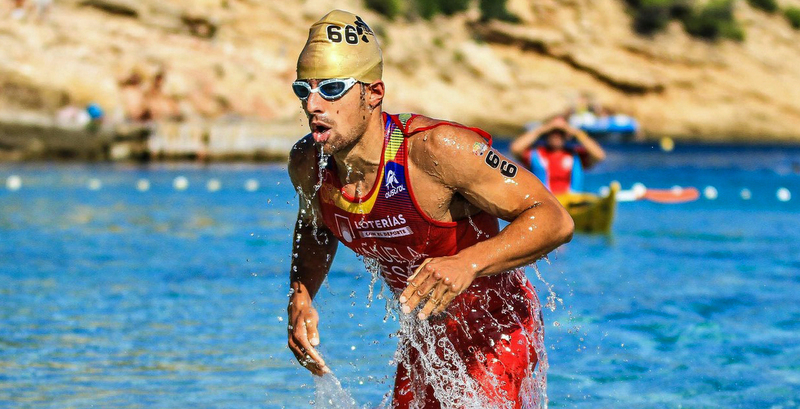 Gold went to José Antonio Abril in his first race on the ETU / ITU circuit. 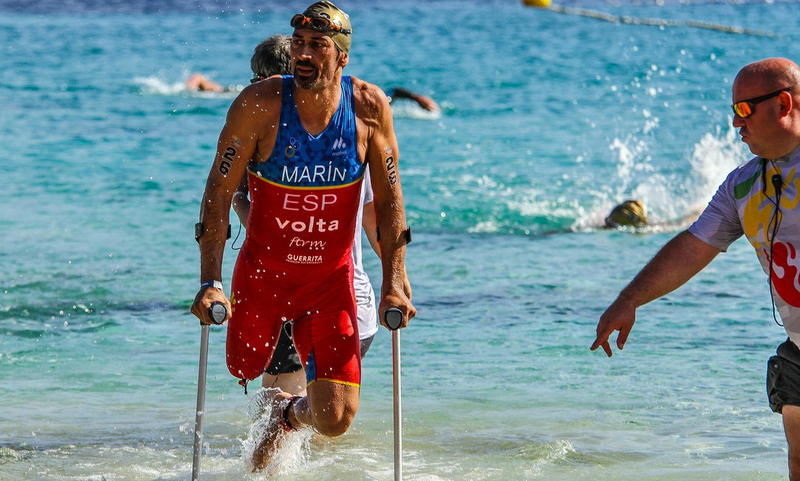 He used his run power to absorb any weaknesses in the swim and bike but in this pretty evenly-matched race, he delivered excellent swim and bike legs, before racing away on the final segment to finish ahead of Italy’s Gianfilippo Mirabile, who goes away from the island with two silver medals from the off-road events. Bronze went to Francisco José López Salar to match his medal in the Cross-Duathlon.